Turkish-mediated discussions between Somaliland and Somalia are progressing well. Helping Somalis "in every possible way" is a "historic responsibility" for Turkey, said Foreign Minister Ahmet Davutoglu on Saturday [6 July 2013]. Davutoglu held a joint meeting with delegations of government officials from Somalia and Somaliland in central Istanbul in a continuation of peace talks that began on April 13 in Ankara. "The relations between Somali, Somaliland and Turkey are beyond any kind of borders," Davutoglu said. "Despite geographical distance, historically we are like a family." The minister described the first meeting on April 13 as a "historic start", where parties agreed on a joint statement to plan future talks. The statement had said country representatives would meet again in three months. On Sunday's meeting in Istanbul, the Turkish foreign minister met ministers and MPs from Somali and Somaliland, including Somali Interior Minister Hussein Gulled and Somaliland Trade Minister Muhammed Omar. "We have always kept discussions on the joint future of our brothers [in Somali and Somaliland] on our agenda, and striven to build strong bridges between them through humanitarian aid," Davutoglu said. "Irrespective of which country they live in, we will help all our Somali brothers and sisters in every possible way." "This is our historic responsibility, as well as a humanitarian responsibility and an indispensable part of our active diplomatic policy in Africa." 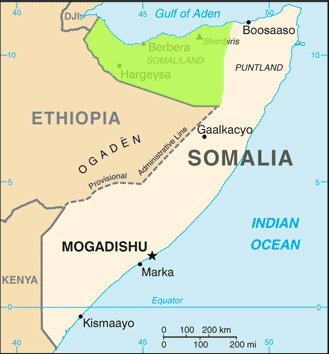 Somaliland is an internationally recognized autonomous region in northwestern Somalia. It sought independence from the country in 1991 when Somalia suffered a government collapse, triggering a civil war that is still ongoing.